Blizzard has revealed three new cards in a Fireside Chat video. If Defender was a mech, it would be so good tbh. It is, people complained about omega defender not being a mech and it's art being unfitting cause it doesn't defend anything with that laser..
but potentially being a 3-cost version of it. You could keep it early and combo it with Demonbolt and Grim Rally turn 7; maybe that is enough? Maybe Team 5 knows something we don't. Maybe Fiendish Circle sees play, either along with Rafaam's Scheme or instead of it because it's more reliable. 1/1s are not that hard to deal with since we got Dragonmaw Scorcher though. The thing about Rafaam's Scheme is that it's got a low mana cost. Hir'eek can only be played late, but it still takes your full turn. Low-mana cost things which can only be played lategame can be handy, since you'll be able to do other stuff with the rest of your mana. As is, this seems like a maybe OK way to recover after a board clear (or after you used your own Hellfire), since you'd likely be able to throw in another minion in the mix, maybe something a bit bigger, and going wide and tall at the same time is pretty handy. Zoo can probably afford to have this wait in the hand a bit, since they've got the draw and flood for early game kinda handled. That's not to say it's necessarily constructed-worthy, but I kinda get it. 3-mana 5/5 worth of stats doesn't seem too hard to accomplish with this. Hir'eek needs a lot of work to be other than a 8-mana 7/7. That's a huge difference. Aggro deck: 3mana one 1-1 minion. 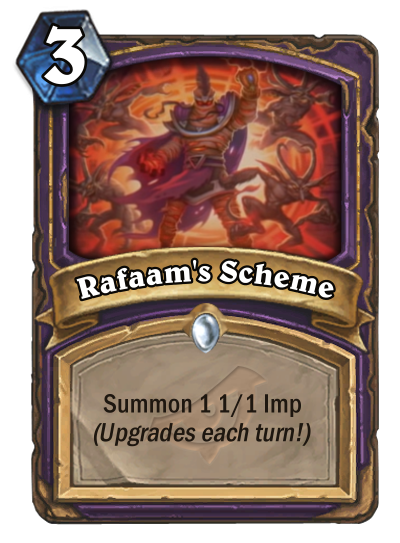 Rafaam's scheme looks like it might have some use if you synergize it with sacrifice cards, though 3 of the good ones are rotating out. Maybe, just maybe, well see a rise of Kill-an-Imp Warlock, where you summon imps to die and buff your other cards or - as some Rastakhan Rumble cards allow, deal face damage. Too bad the spell doesnt gove them rush, then everyone would say how good of a card it was. if Warlock gets another cheap board clear that does less than 3 damage, you could set up a Spirit of the Bat the turn before, then play scheme and kill all the imps at once. Well the Scheme is very bad. Can't see much chances for it to be played - even in Arena. On the other hand the Devastator will be an arena star. I see many Chillwind Yeti in standard... Maybe somewhere in wild rank 50 this is happening, but not in standard for sure. But as I said this Omega Devastator may see its play at least as card from discovery. Maybe it may see in some control warrior play. But it is not ultimately powerful. First 9 turns it is playing as just 4/5 body, which no one need actually. Dyn-o-matic is much better, because it can play every turn. But in general it is not bad card, but definitely not OP. And to be honest improve morale as an execute activator? Are we playing in the same game. If someone want to do that, why they wouldn't just use Inner Rage until now. Give me at least one deck in which someone use inner rage as activator (and of course it is not fun deck, cos in them we can play even quest hunter). 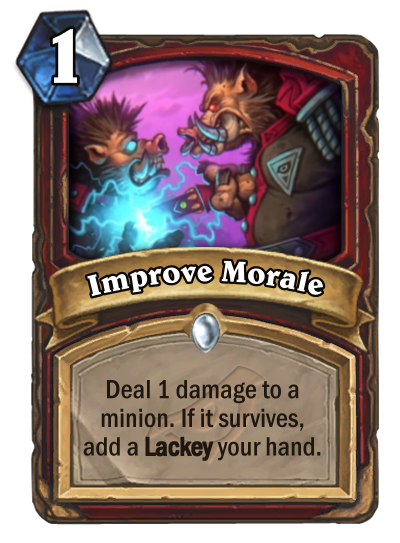 Only good thing here is lackey, but I doubt that control warrior care for them that much. Rafaam's scheme will see no play. Zoolock don't need it. We already have card summon 4 imp for 4 mana. It is a bit worst, but noone even try to play it. Warlock may see no play in next expansion after a lot of cards rotate, but for sure it wont be lock on tokens. There was a lot of spam tokens cards in lock for past few years, how much of them saw some play? Of course they may release some imba, OP card for lock which will make them play but whatever. It doesn't make this card any better right now. Maybe we're underestimating the power of an on-curve Mechanical Yeti in a low power level meta where Wargear and Zilliax are legal. It's prob a lot better than that 4/4 stealth for 1 turn mech. Tho u may be right and the community is making the same mistake as Leyline Manipulator where its payoff just isn't that good. 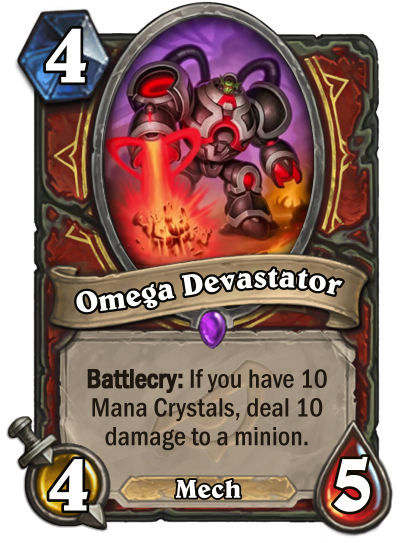 Omega Devastator + Zilliax (Magnetized) on turn 10 will be a 7/7 Lifesteal, Rush, Taunt and Divine Shield that deals 10 damage to a minion for 9 mana! I’m hyped for it! Shaman gets echo, rogue gets a trap or recruit, and warlock gets a card that shuffles something? First of all what you just said made no sense whatsoever. Second of, telling people who has a different opinion than you to kill them self’s really doesn’t help your argument. Reported for telling people to kys. There is no need for rude and disgusting attitude. Second of all, if you really hate this game, then move on. Why are you even here on this site, commenting forums, putting up deck lists and whatnot? What are you? Sadistic? !